NEW BMW M2 COUPÉ COMPETITION. A new take on a classic. Get your game on. The new BMW M2 Competition is a welcomed addition to the BMW M Range, with it's striking racing DNA factored into every minute detail. It's familiar silhouette is impressive form every angle and by incorporating the new enlarged air inlets, M gills and M2 competition badge, you have a truly unmistakable modern take on a classic. BMW Media package including Navigation system, Online Entertainment and Remote Services. 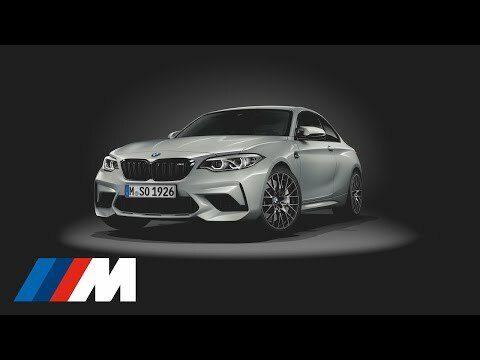 THE BMW M2 COUPÉ IN MORE DETAIL. Hear the instantly recognisable roar of the M Bi-Turbo inline 6 cylinder petrol engine, which has you going from 0 - 62mph in just 4.2 seconds*. The stunning BMW M details catch more than just your eye with additional new features, including two new metallic paint colours; Sunset Orange and an exclusive BMW M2 Hockenheim Silver. ​Make your presence known with the adaptable sound of the M Sport Exhaust system transforming specific driving modes at the touch of a button. The new BMW M2 Competition is more than just quick off the mark, it handles the roads with ease with the help of weight-optimised twin turbochargers and a front end carbon precision strut. *achieved with optional M DCT transmission. A design to send your pulse-racing. With an interior to match its sleek exterior design, the BMW M2 Competition is all about achieving an authentic Motorsport feel. The interior is set in premium Black Dakota leather with an illuminated M2 logo, perfectly accompanied by red dials on the M specific instrument display. Top it off with the option to personalise the drive by setting individual driving profiles to fit your needs. Fuel Economy figures for the BMW M Series range: Extra Urban: 26.2 - 42.2 mpg Urban: 14.6 - 25.4 mpg Combined: 20.3 - 34.0 mpg CO2 emissions 325 - 194g/km. Figures may vary depending on driving style and conditions. Test drive subject to applicant status and availability.